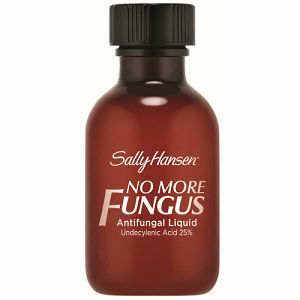 Sally Hansen No More Fungus is a product that does exactly what it claims: gets rid of fungus. Sally Hansen claims to be the strongest antifungal available without a perscription. But is this just another unprecedented claim? Sally Hansen contains 25% of its active ingredient, Undecylenic Acid. Undecylenic Acid is derived from castor oil, and is used to treat many ailments from ringworm to nail fungus. It works to relieve itching, burning, and irritation. It also gets rid of the fungus that is causing the problems in the first place. No More Fungus also contains fragrance and oils to leave nails soft and get rid of the fungal smells. No More Fungus works just like nail polish–simply brush it on your nails once a day and let it work its magic. For ringworm and Athlete’s foot, it is recommended that you apply once a day for four weeks so that a new layer of skin can grow fungi free. Undecylenic Acid can cause irritation to sensitive skin, including itching and redness. If the user experiences no noticeable results in 4 weeks, or experiences irritation, they should stop use and ask a doctor. Should You Try Sally Hansen: No More Fungus? No More Fungus is widely available and at an affordable price, but this product is not ideal for those with sensitive skin. Jack Stevens	reviewed Sally Hansen: No More Fungus	on March 27th	 and gave it a rating of 3.